Hello Duelists! As I'm sure you all know, Crush Card Virus is finally legal for play again! It has been brought back with a slightly weaker effect, but it's still a very powerful card. This week I'm going to be discussing what decks can use Crush Card Virus, and most importantly, when to activate it. 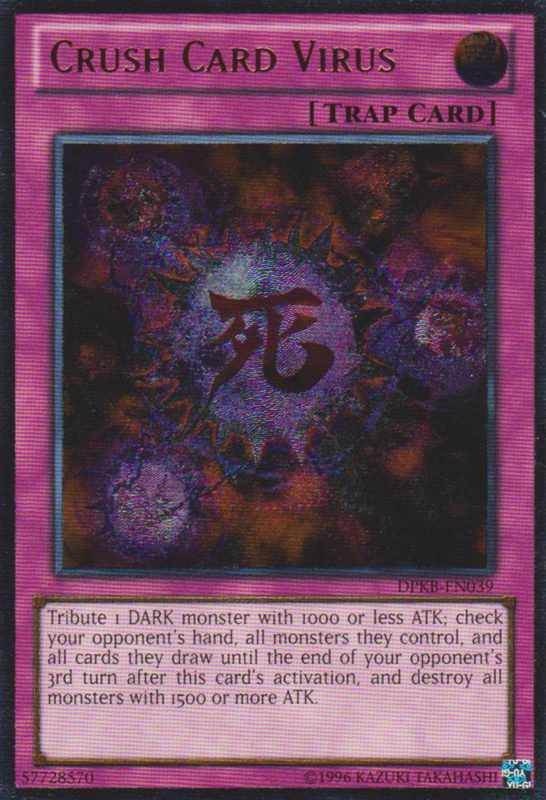 Here's the most updated text of Crush Card Virus: Tribute 1 DARK monster with 1000 or less ATK; your opponent takes no damage until the end of the next turn, also, you look at your opponent's hand and all monsters they control, and if you do, destroy the monsters among them with 1500 or more ATK, then your opponent can destroy up to 3 monsters with 1500 or more ATK in their Deck. I wasn't playing Yugioh the last time this card was legal, but the changes don't seem ridiculous to me. The changes that the errata made are: You no longer get to check your opponents hand for 3 Turns (probably the most relevant change), Your opponent takes no battle damage until the end of the next turn (less relevant because of the huge advantage you gain), and your opponent can destroy up to 3 monsters with 1500 or more attack in their deck (fairly relevant when playing against certain decks, I'll go into more detail in a bit). I won't go into much detail since it's pretty obvious; if you're using Burning Abyss then you're gonna want to use this card, because it will almost always be live. If you're playing against Burning Abyss and you draw Crush Card Virus, that's pretty unfortunate. I wouldn't activate Crush Card unless they have used Cir's effect that turn, that way maybe I can hit a Cir out of their hand, and, if I'm lucky, a Mathematician. You want to wait for them to use Cir's effect that turn because if they haven't used Cir yet they will be able to destroy it from their deck and trigger its effect. Another pretty obvious deck that has pretty good interaction with Crush Card Virus would be Shaddoll. This is a deck that I have seen gain popularity all of a sudden. With Qliphort no longer being a very viable option Shaddoll have been seeing a comeback. Crush Card is very easy to make live with this deck: all you need to do is get access to Shaddoll Squamata's second effect and send Shaddoll Falco to the graveyard. Just remember that if you tribute your Shaddoll monster with Crush Card Virus this will not trigger its second effect because it is a cost to tribute. When playing against Shaddolls, you almost never want to activate Crush Card Virus because this will allow them to send Shaddoll Squamata, Beast, and Dragon from their deck to the graveyard for free and trigger their effects. So unless your opponent has already used those effects this turn, I probably wouldn't even activate Crush Card Virus against them. Now you're probably thinking to yourself how can these decks possibly utilize Crush Card Virus? Well there's actually two ways. Ever since the semi-limiting of Nekroz of Brionac having Brionac be the only way to search your Shurit hasn't become optimal. Since if you search for Shurit with Brionac that turn and then ritual summon something using Shurit, if you search Brionac off Shurit then that's your last Brionac, and as a result Nekroz players have adapted and started using Reinforcement of the Army (since it can also search Clausolas). And Satellarknights use 3 Reinforcement of the Army anyway. The card that I'm about to suggest has utility with both Reinforcement of the Army and with Crush Card Virus, but the best part about it is that it's an out to the Djinn lock! (Assuming they don't have Nekroz of Trishula, anyway). Destiny Hero - Doom Lord. It's effect is: Once per turn: You can target 1 monster your opponent controls; banish that target. You cannot declare an attack the turn you activate this effect. You must control this face-up Attack Position card to activate and to resolve this effect. The banished monster returns to the opponent's side of the field, in the same battle position, during your 2nd Standby Phase after activation. Assuming you use 3 Reinforcement of the Army then that gives you 4 outs to the Djinn lock, not counting any Book quick play spell cards you use. There’s an interesting interaction if you’re using Nekroz: since the monster is summoned back during YOUR second standby phase you can Trish your opponent after it comes back. After actually testing with Crush Card Virus, I have come to the conclusion that it is an absolute blowout in the Nekroz mirror but not super amazing against the other decks. Because Nekroz already main-decks so much hate for the mirror and not against the other decks, I would say that having a couple more cards that help you autowin in the mirror is probably worth making your matchup against other decks a bit worse. The main problem with Doom Lord is that he is a level 3, so other than summoning back a Clausolas he doesn't have much synergy with the deck. Satellarknights on the other hand also don't have many outs to the Djinn lock so this card may be a good choice. But it has the same problem here as it does in Nekroz, because it's a level 3 and not a level 4, it doesn't have any synergy with the deck, and it also takes up a normal summon. Doom Lord sound a bit too gimmicky for you? I want both Satellarknight players and Nekroz players to look at their extra deck closely, do you guys notice something? You already have a card that works with Crush Card Virus! Number 80: Rhapsody in Berserk! It meets the requirements for Crush Card Virus, and making a Rank 4 in Satellarknights is very easy, and usually all you need in Nekroz to make a rank 4 is a Manju/Senju +1 combo card. Against Nekroz I would definitely want to have Crush Card Virus, and when playing against Satellarknight resolving Crush Card Virus can really hurt them if they don't have a Call of the Haunted. The timing for activating Crush Card Virus against Nekroz can be pretty tricky and depends heavily on the information you know about your opponent’s hand and what rituals they’ve already used that turn. For maximum impact, you’ll want to make sure they can’t Cycle back a monster that they send from their deck (and they will probably send Trishula if they haven’t drawn it), and you’ll also want to do it after they use their normal summon, so they can’t search out more rituals that turn via their graveyard effects. Them having a Shrit in their hand with Cycle can definitely get them back in the game. That's all for this week's article! 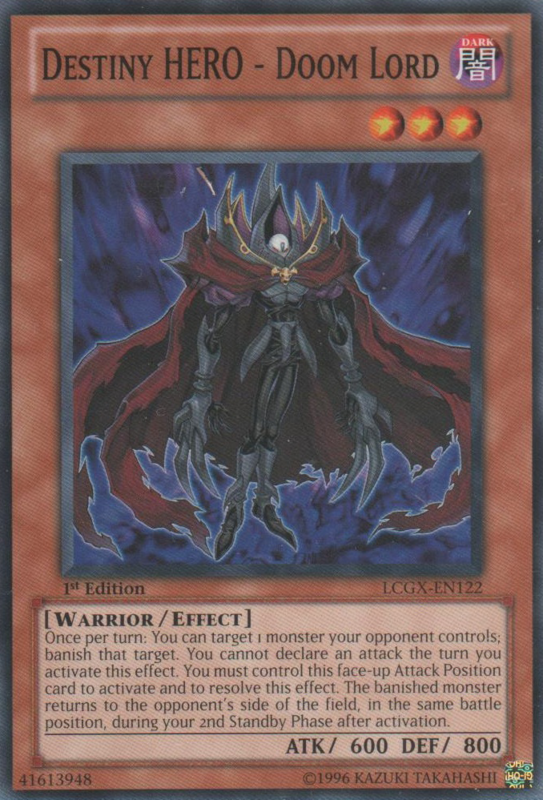 Do you guys think that having a card that blows your opponent out in the Nekroz mirror (and probably autowins you the game if they don't have a Manju or Senju) is worth the costs? Let me know what you guys think in the comments down below. Special thanks go out to Jonathan Storm King Albornoz for giving me this week's article topic! If you'd like to see me write about a certain topic feel free to message me on Facebook. The Circuit Series stops by Richmond, VA next on May 2-3! And As Always Play Hard or Go Home! Doom Lord is a pretty cool pick. I’ve been using Berserk as my crush card target in Nekroz, as I csn banish two ritual spells in my opponents grave, and set crush for the game win.